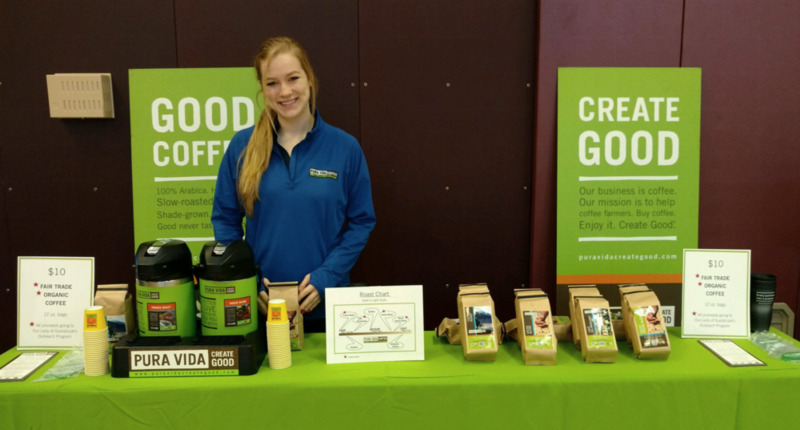 Our traditional bulk fundraising program allows you to purchase our 12 oz bags of coffee at a discounted price and then sell them at retail (or whatever price you choose), using the profit to support your organization. You can either order in advance to have on-hand for your event or take pre-orders from individuals and distribute the coffee later. This is our most popular fundraising program! To receive discounted pricing you must order a minimum of 2 cases (10 - 12 oz bags per case for a total of 20 bags). Each case must contain the same coffee (blend and grind). Taking pre-orders from individuals ensures that you order the proper amount. Sell or distribute it to the individuals who placed orders. Orders must be placed via phone or e-mail with Pura Vida's customer service department. Register by emailing us at info@puravidacoffee.com. Once we receive the form we will create a fundraising code specific to your organization and a link for your website. The link is placed on your website which directs people to our web store. By using this link, we are able to track all sales related to your organization. Spread the word to all your friends, family, and neighbors about your fundraiser. Anyone who uses the link from your website will generate funds for your organization. Receive your funds from us at the end of each quarter (calculated based on a percentage of sales, net of shipping costs).